I've spent the last few weeks working on my new website, which was designed by the good folk at Silver Vine. This new site will focus on my writing and my books, rather than on teaching, although I will still post plenty about the writing process. If you'd like to read an excerpt from my new book, His Other House, you can do that here, where you will also find book club notes. I've been told that the book has sparked some pretty feisty and satisfying book club discussions. I will be posting weekly about the writing and reading life, and will send the posts out as newsletters. If you'd rather not get weekly newsletters from me, you can simply unsubscribe at the bottom of a newsletter. In the meantime, it’s perfect autumnal weather in Mullumbimby – sunny, crisp and still - and quite possibly my favourite time of year to be writing at my desk in the backyard studio. The sun pours in, and every now and again I lift my head to look out at the sub-tropical greenery (and a bright blue trampoline). Occasionally someone walks up the back lane, which is only a few metres away, but the sound of them passing, their feet crunching on the gravel, is companionable rather than distracting. 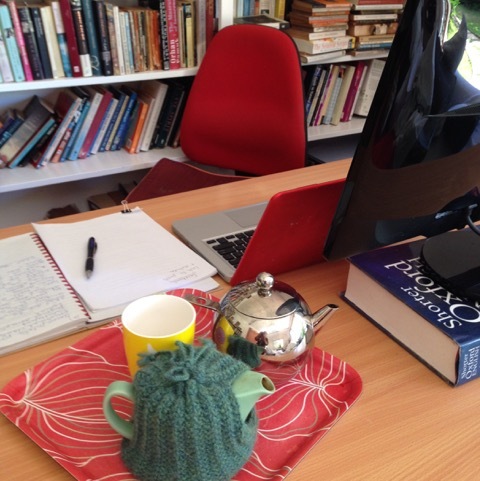 I am working on my third novel and it covers some quite tricky emotional territory, so this sunny studio and the two teapots by my side (one herbal and one ‘real’) are the perfect counterweight.